Shri Shrimaatha Samskrita Graduation and Post-Graduation Centre was established in 1962, with the main purpose of providing encouragement to ancient culture based education, like Veda,Shastra,Purana, Darshana and Philosophy. In the year of 1969, the Institution achieved permanent recognition by the education department of Karnataka for running the Sanskrit Prathama, Kavya, Sahitya, Veda-Prathama,and Veda-Pravesha classes. In 1979, the Institution was granted aid by the education department. In 1992, Veda-moola,Vidvanmadhyama, Vidvaduttama(Alankara ,Vyakarana, and Krishna-yajurveda) classes were started with the recognition of the education department. The college contains a library with over thousand reference books related to Vedas Alankara, Vyakarana, Vedanta, Astrology, Darshana, Dharmashastra and general texts like Ramayana, Mahabharata, Mahakavyas and Dramas etc . There is also a free hostel facility for poor students. 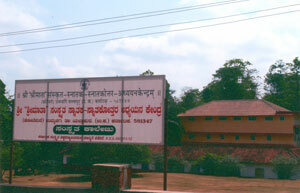 Students are granted scholarships by the Government of Karnataka, based on merit. There is also a computer centre in the college, with eight computers and other implements. The college has a comfortable playground on the premises, and students are encouraged to play games like Cricket, Volley – ball, Kabaddi, Tenny-coyet, Chess, Tennis, carrom,and Kho-kho. Sanskrit Lecture Series, Camps for Sanskrit conversation, Extempore speech competitions, competitions in play – acting, radio programmes and street Dramas are all organised as part of co-curricular activities.